Preserving and protecting the environment plays an important role in our business philosophy. We have embraced the Earth’s natural diversity and sought strategic alliances with environmentally conscious manufacturers using the most readily available recycled materials whenever possible. Our primary manufacturing plant has achieved numerous international accolades and certifications, including EcoCert, which ensures food and cosmetics are manufactured using natural and organic ingredients in accordance with respectful environmental practices. Our plant has also achieved EcoLabel Certification, Hong Kong Green Mark Certification, and GMPC (Good Manufacturing Practice of Cosmetic Products) from both the U.S. FDA and European Union. Our cruelty-free products are never tested on animals and no animal ingredients are used in our formulations. Most products can be recycled and we encourage customers to do their part. RSA is a part of the WasteWise Business Network, an organization established by the United States Environmental Protection Agency (EPA) to promote waste reduction, recycling, and recycled product procurement. RSA has been a leader in developing products that allow hotels to foster their environmental concerns while still remaining budget friendly. We are constantly researching and developing new materials and packaging that minimize environmental impact. Our pioneering efforts have yielded product lines including Green Natüra, which features Post Consumer Recycled (PCR) plastic as well as bio-additives to assist in product degradability. Environmental sustainability also plays an important role in product design. For example, our signature “Waste Reducing” soap eliminates the unused center of traditional bars, allowing hotels to offer a larger size with less waste. We offer recycled paper packaging, soy based inks and other innovative materials designed to reduce environmental impact. EcoPure® is an organic additive that accelerates the biodegradation process of plastic products and plastic packaging in a biologically active landfill and enhances the environmental sustainability of these products in their end-of-life. EcoCert is a private organization that certifies the organicity of a product. It focuses primarily on the raw materials (natural/synthetic) but it checks also all the production chain, ending with the product disposal. EU Ecolabel studies the environmental impact of a product over its entire lifecycle from extraction of raw materials through manufacturing, distribution, use and disposal. EPI is the developer, licensor and distributor of Totally Degradable Plastic Additives (TDPA®). EPI’s technology has been designed to control and manage the lifetime of products made from the most common plastics used by modern society. Post Consumer Recycled Materials (PCR) are featured in some of our amenity lines and custom products, including Green Natüra. Using recycled plastics keeps waste out of landfills and helps sustain a healthy environment. Many products are produced with paper made from up to 100% Recycled Materials, including cartons, standard and tissue paper used for soaps, and labels. Keep the environment in mind when choosing recycled packaging. In an effort to create bottles, paper wraps and cartons as environmentally friendly as possible, we use 100% Soy Based Inks whenever possible. The Roundtable on Sustainable Palm Oil is an organization that promotes and ensures the farming of sustainable palm oil. To read more about them please visit www.rspo.org. RePET stands for recycled polyethylene terephthalate. Each RePET shower curtain saves 60 water bottles from entering the world’s landfills. A responsible alternative to PVC, PEVA is manufactured without chlorine, which is harmful to the environment. 3) Increase Positive Guest Perception. Matthew 25: Ministries is a top-ranked humanitarian aid and disaster relief organization headquartered in Cincinnati, OH. Matthew 25: Ministries rescues and reuses more that 15,000,000 pounds of corporate discontinues, misprints, overruns, off-spec, slightly damaged, returned and past season products each year and redistributes them to people in desperate need throughout the U.S. and worldwide. Each year, Matthew 25: Ministries impacts the lives of approximately 20,000,000 individuals throughout the United States and around the world. More than 99% of Matthew 25: Ministries' cash and in-kind donations go toward programs. 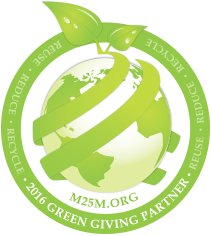 Please visit M25M.org for more information.